This week I was poked and prodded, all part of regular check-ups to monitor the effects of Motor Neurone Disease on my body. Throughout it all, I felt a strong sense of God with me. 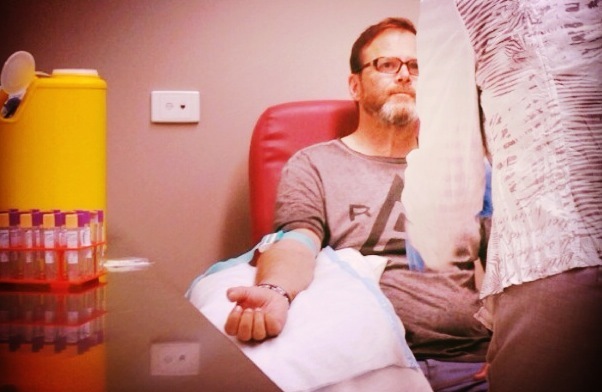 I thank God that this disease, as bad and dark as it is some days, has not shaken my faith. The strange thing is that in our humanity, we can sometimes allow our belief in God’s goodness and love to become weakened because of someone else’s trial or dark times. I have witnessed people get mad at God on behalf of someone else and yet the person going through the bankruptcy, broken relationship, illness, or loss is not mad at God at all. To the contrary, the person going through it is dependent on God’s presence and comfort in the midst of what they are going through. Can I encourage you not to carry offence towards God on behalf of someone else? Don’t take on offence because of what others are going through. Don’t make my trial your excuse. It takes a strong person to be able to get close to another’s weakness, close to their mortality, and stay strong in their personal faith in God. Let me say on behalf of all those in a trial, we need our friends to be strong, not mad. Watching your strength gives us strength. Watching you become weak over our trial only adds to our trial. I think of John, the disciple of Jesus. In Acts 12, we read that his brother James is killed by Herod as a young man. In the very next verses, we see that Peter gets supernaturally rescued by God. John’s brother dies while Peter is saved. We see that not only does John stay the faith through this trial, he encourages and supports the growth of the Church through writing books that expound God’s faithfulness in trials. This doesn’t sound like someone who, because of the trials of others, had become disillusioned, offended or bitter with God. And so, whatever you are observing in another’s battle, please continue to have compassion, continue to care and support them. Fight for what is right and for justice but do not get offended with God because of someone else’s dark valley. God and us will be ok. If you need God’s strength to be strong for someone else, I encourage you to get into His presence, spend time in His Word, ask Him for strength. By the way, I’m doing a road trip in the USA with my good friend Steve over the next three weeks so for “Fridays with Phil” updates, follow my journey on Instagram (@pcamden). Have the most fantastic time Phil! What an adventure! You are a true testament to the faithful strength of God. Thank you for sharing this and being an encouragement! Thanks for the read Aaron and your reply is an encouragement to me. Thanks Judi. So sorry to hear about both your trials. Its ok to have tears, God understands our humanity and need, thats why He can be the source of our strength and courage. Thanks again for your encouragement Judi. I know this is true also for you, the greatest encouragement for me, is hearing that others have come to know God or have drawn closer to Him through my trial. Thats so true Bill. When we take what the enemy meant for evil and allow God to turn it around for GOoD. To use it for a witness of Gods love, then somehow it gives meaning to it, when otherwise there would be no reason. Wish we could drop by but I looked up where you live and we are going in wrong direction. We are visiting family in Seaside Oregon and then driving back to LA. Blessings my friend. Love your passion PHIL. Very inspiring, so thank you for sharing your heart. So helpful!!! Thanks John. Really appreciate your reading and reply, your an encouragement to keep going. Pastor Phil you’re such an inspiration! Thank you for being a vessel of God in this generation. Pastor Phil you are such an inspiration! You are such a blessing to everyone around you! We miss you heaps and your teachings. God bless you and safe journey. Hope you have lots of fun and stories to tell. Thanks Carol blessings for today may it be filled with Gods peace.